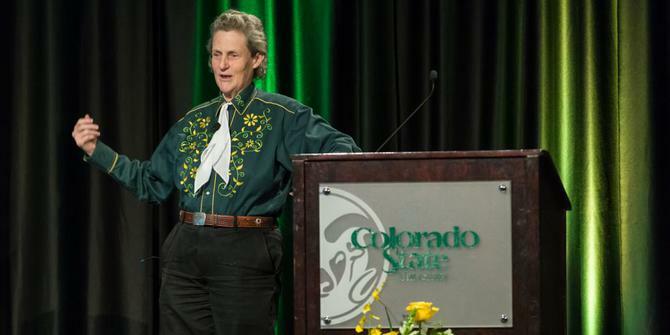 Temple Grandin spoke at Colorado State University about the importance of maintaining high expectations for people with autism. She is truly a great advocate and has done a great deal to help the rest of us understand what it is like to be on the spectrum. Her speeches and comments, reflecting her own experiences, give us a particularly good perspective on the significant struggles faced by people with Aspergers and others who are generally considered to be on the high-functioning end of the spectrum. According to the Denver Post article, Grandin says that the biggest obstacle for most autistic students is to learn to do well in social situations. This challenge is, of course, even more, difficult for people on the “low-functioning” end of the spectrum; i.e. those with no verbal speech and who have difficulty attending to an individual or task for even a very short time. Although Grandin’s comments in Colorado don’t appear to have addressed the issue of setting social expectations for low-functioning individuals, I’d suggest that it is important not to short-change anyone on the spectrum by giving them a pass in social situations. My son, for example, can’t say “hello” but he accepts a handshake or offer a greeting by using his augmentative communication device. He may never be as socially adept as Temple Grandin but he’ll continue to make progress. ← What should I ask when starting ABA? Reducing Stress Through Your Lifestyle To Run Optimally!